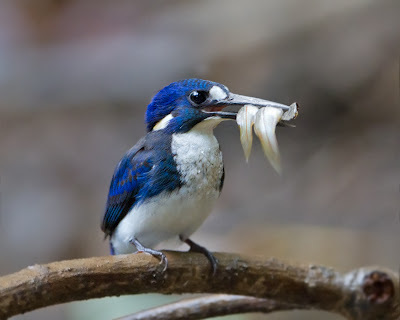 Red Mill House - Daintree Birdwatching: Little Kingfisher is back! 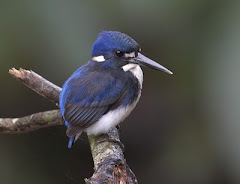 After disappearing for a few months over the Wet Season, the Little Kingfisher has returned to the pond in the garden at Red Mill House. Australia's smallest kingfisher, and probably the most elusive, this bird is a target species for many birdwatchers visiting tropical north Queensland, and Daintree in particular. This lovely photo, taken last year by JJ Harrison from Tasmania, shows the Red Mill House Little Kingfisher looking more like a Puffin than a Kingfisher with his mouthful of fish! 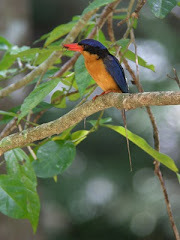 The Little Kingfisher is a bird of lowland rainforest streams, preferring dark, narrow spaces with overhanging vegetation. It may also inhabit lakes, estuaries and coastal mangroves. It perches low, plunges deeply into the water for fish and small crustaceans and returns to perch. It will often bob it's head and wings while watching for prey.